Providing access to accommodation, stairs rising to first floor, Karndean flooring, under stair storage cupboard housing 'Glowworm' gas fired boiler serving both domestic hot water and radiator central heating. Glazed double doors to dining room. 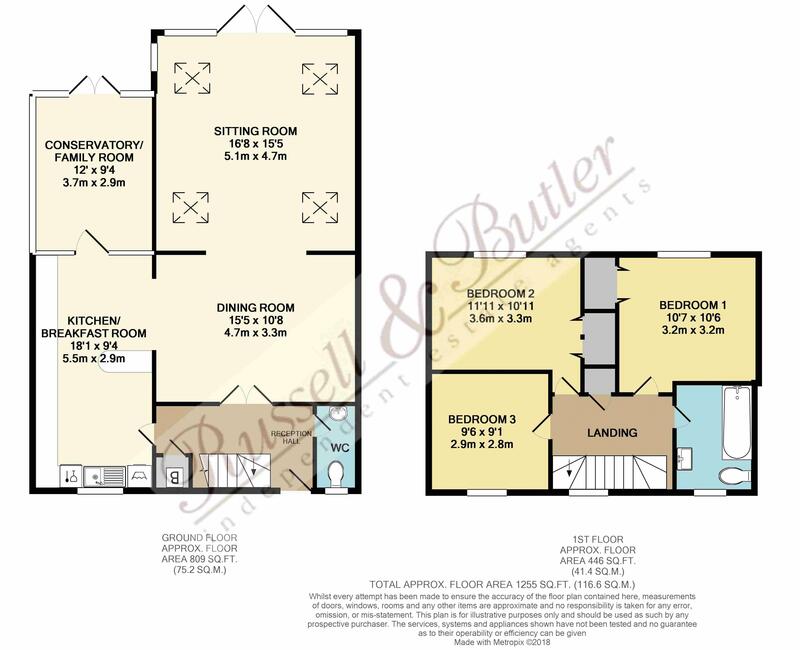 White suite of low level W/C, wall mounted wash hand basin, Karndean flooring, radiator, Upvc double glazed window to front aspect. A light and airy extension with vaulted ceiling, inset down lighters, Velux windows, French doors leading to the patio and rear gardens, Karndean flooring, radiator. Fitted to comprise inset single drainer sink unit with mono bloc mixer taps, cupboard under, a further range of wall, drawer and base units with composite Granite work surfaces over, upstands and splash back to cooker. Space for fridge/freezer, integrated dishwasher, space for cooker, space and plumbing for washing machine, coving to ceiling, inset down lighters, Karndean flooring, window and door leading to conservatory. Upvc and brick base conservatory with ceramic tiled floor, radiator, French doors leading to patio and rear garden. Upvc double glazed window to front aspect, airing cupboard housing hot water tank with linen shelf as fitted, access to loft space. Built in double width wardrobe with hanging rail and shelving as fitted, radiator, Upvc double glazed window to rear aspect. Built in double width wardrobe with hanging rail and shelving as fitted, radiator. Re-fitted white suite of panel bath with mixer taps, glazed screen, low level W/C, wash hand basin with storage cupboard under, chrome ladder/heater towel rail, full height ceramic tiling to all walls, Upvc double glazed window to front aspect. Laid to lawn with established shrubs and borders, driveway for several vehicles leading to detached single garage. With up and over doors, light and power connected, eaves storage space, personal door to garage. The rear garden is multi level with several seating and patio areas, well stocked beds and borders with established shrubs and trees, wooden post and railing with steps leading down to further secret garden.